Four acres of fun and fear await you here. Begin your journey in a creepy old tobacco shed filled with rooms and rooms of twisted scenes. We bring the outside in, and take the inside out as you wind your way through, up and down, sometimes spinning as you go. At one point we will release you to the outdoors where you will find monsters, scenes, trails, and props that you’ll only find in our all new “Wicked Woods”. Demons fly, werewolves howl, and even dragons will rise above you as you cower in fear. Then, back inside for a little torture while we see who will make it out. If you survive that then you might have a chance of making it through the bats in the caves, or the many reptiles of the swamp. Not done yet? Neither are we. We have an all new Zombie paintball shooting gallery to test your survival skills as well as some delicious food from Fork in the Road (Concessions) Your season just isn’t complete without a trip to The Haunted Barn. We suggest teens and up, however we leave it to parental discretion. 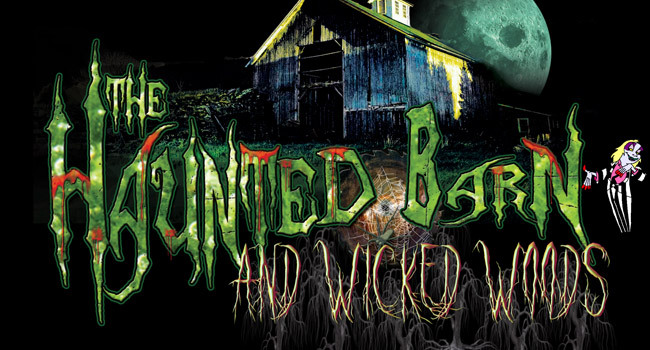 How was your experience at The Haunted Barn? 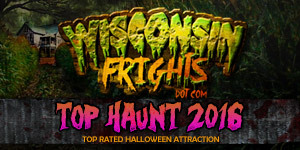 Okay, this is my favorite haunt in Wisconsin. I am a veteran haunter myself, so I don’t go for the scares, I go for the artistry. That being said, this is a beautiful haunt. I have been a fan of Haunted Barn for several years now, and the primary reason is their attention to detail. This haunt has a personality to it that you don’t see in any of the other ones. The staff is well placed and well trained to perform in ways that are creepy and not nearly as gimmicky as other houses. The props, staging, and sets are phenomenal! I like many, many aspects of this house. It’s a good house for people who are looking for a scare, as well, because there are many unexpected scares that come out of it, but at the same time, I think that the staff seems to be aware of the sensitivity levels of its patrons, and can amp up or dial back as needed. Definitely make the drive out for this one! This haunt is a MUST see! I was completely terrified from the moment I walked down the entrance ramp. The scare actors pop out at you from every angle and just when you think you done… they send you to the CLOWNS! Beware pansies, if you quit or wet yourself the will let every in line know by adding you to the large score board. We make the trip from Iowa…well worth it…even spent one of our wedding anniversaries there!!! They don’t disappoint!!! I walked out huffing and puffing from all of the fun and screaming that I did, and my boyfriend was in shock at how amazing the actors were and how real everything seemed. Best year yet!! This haunt us a MUST SEE!!!!! This year topped all years!!!!! Well worth the trip!!! I travel 2 hours every year to go! Love The Haunted Barn!!! Expertly constructed. Everything looked real. The actors were so involved in their scenes. It’s very clever too. You have to use your brains to make it thru. Really good creepy fun! I thought this was a very well done haunted house! The amount of time that was put into every scene throughout the haunt was very well detailed and perfected as I went through the haunt. I am very excited to bring the “Terror Crew” on October 10th! Make sure to check out this haunted house not only do they have an awesome haunted house but the people who run it are very friendly people! There was definitely a lot of scares. I thought it was better in 2013. I missed the outdoor portion.The fortune teller was a little boring and not my favorite. I’m also not a fan of being touched since I didn’t expect it. If I can’t touch you, you shouldn’t be able to touch me.